"Now, there are two ways to make barbecued banana bacon: You can start with bacon and add bananas, or you can start with bananas and add bacon. It's really up to you. And while that's in the oven, let's check on our waffles. You want them crisp but not crunchy, brown but not black, hot but not cold." 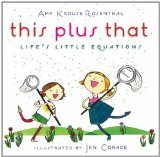 Take one five year old big brother, add one two year old little, spunky sister and mix in many cups of hilarity...that delicious and unique concoction is what you get in this lively new book from a newbie to the children's literature field and an accomplished artist. Oh I forgot, a generous dollop of imagination! Henry is keen to do a cooking show for TV, and kind enough to let his little sister Eleanor (well, he likes to call her Elliebelly) help him with the recipe. She's cute, but remember....she's two! Things are not likely to go as planned. First things first, a chef's hat doesn't cut it for Elliebelly. She wants a pirate hat. A series of similar missteps lead to a cooking show disaster. You've seen some of those on TV yourself. The occasional break in filming or a fade-out to commercial allow for some unforseen changes in the script. It's always funny and never tedious. Poor Henry! He just keeps forging forward. Elliebelly is ready for anything, and can't wait to taste the 'raspberry-marshmallow-peanut butter waffles with barbecued banana bacon.' Did anyone tell her that it was only PRETEND? Mom comes to the rescue with a real meal, and the two are off the air...until the next time! The pairing of Carolyn Parkhurst with Dan Yaccarino is testament to great editing. The author has the language of the siblings down pat. They seem to echo conversations I have heard and create a great back and forth for young readers. The artist fills the pages with recognizable youngsters, with their wide eyes and always open mouths. The body language and expressive faces add fun and familiarity to the text. The bold primary colors and softened edges are perfect. Take a close look at the endpapers...any parent will recognize their lives with young children amongst the images. They are an open invitation for kids to step inside and see what the book has to offer. I like the design, too. The text in bold black at the top of the page is Henry's script and Elliebelly's is constantly interjected in red. Readers will love the opportunity to read the story in pairs, or even trios (with someone reading Mom's words), using wildly expressive voice to bring the characters to life. This is fine historical fiction, told in Margarita Engle's elegant and descriptive verse. The author adeptly tells Fredrika Bremer's story, using the letters, diaries and sketches that Bremer made when she visited Cuba in 1851 and other included resources. 'Fredrika Bremer was Sweden's first woman novelist and one of the world's earliest advocates of equal rights for women' and as such, provided a most worthy subject for this book. She traveled the world in search of a place where people were treated equally by everyone. She loved the climate and beauty in Cuba; but she was distressed by issues of slavery and her helplessness in making a real difference there. She stayed for three months. Her stay was longer than planned in order to help Cecilia, her translator. Cecilia was a slave who longed for her African home; whose pregnancy, difficulty breathing and arranged marriage make her a most sympathetic character for readers. Elena is an imagined character, endlessly curious about the world and allowed freedom with limitations. She is twelve when she meets Fredrika, and sure to be married by the time she turns fourteen as was the custom of the day. Her work is to learn the skills that will make her a valued wife and to add to her hope chest. There are four narrators, the three women mentioned and Cecelia's husband, Beni. Each has a personal perspective for Cuban life and the other characters. It is fine writing that makes each of them a fully realized participant in the story they share. The women meet by chance and as they travel together, they find that they have a common goal...they want everyone to experience freedom and equality. Though their language and culture differ greatly, they find a kindred spirit in each of their traveling companions. drinking hot tea with sugar. I thought about taking a nap. So I swam around my bowl." 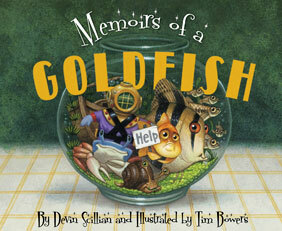 With his bowl to himself and his simple routine, Goldfish enjoys his life. Then, others are added to the bowl. It begins with a bubbler; Goldfish is not impressed. He does nothing but bubble and really doesn't add anything to Goldfish's well-being. Then come plants, a snail with a penchant for slime, an aggressive crab, a pirate ship and even a visitor from Hollywood. I was trying to find room for a swim today when Rhoda and Clark told me that they are going to have babies soon. Like there's room for THAT." Finally, it's just too much and Goldfish has a meltdown. Screaming for peace and quiet, he finds immediately himself floating alone in a small, clean, heavenly place. He is delighted....and alone. It doesn't take long for him to wonder what will happen to the others. Who will help when they run into trouble? Tearful and distraught, he longs for their company once more. To his surprise that wish is soon granted, as all the occupants of his first home are reunited in a much bigger place, one meant for 'family'. The surprise ending will bring delight! The artwork is wonderful. It's filled with expressive and unique personalities, bold, bright colors, and a most appealing design. Taking a careful look, wide-eyed listeners will note each new addition to the fishbowl family. There is so much to see as the story is shared..
human being on the planet." No wonder there are so many darn ants in my front lawn! I might have my 200 million share right here....yech!!! As I sit on my front step, I watch in wonder at their constant motion and industriousness...and hope that they do not find their way inside. They would not be happy here! I am forever singing the praises of DK Publishing for the wonderful work they do in bringing amazing and 'much in demand' nonfiction to our little ones. On the double page spreads created for this book, kids get an up close and personal look at a wide variety of 'bugs'. There are numerous questions about each one, plus a box titled 5 things to know about us. The questions are answered, the captions and labels useful and readers come away with an expanded knowledge of each of the 'icky' and 'elegant' critters. Bugs are the perfect respondents. When a butterfly is asked where it goes when it rains, it answers: "We hide under large leaves or rocks and hold our wings tightly together. If the rain is too hard, our wings will be damaged and we will die." "Why do ants have armies? We are social insects, which means we live in a group, or colony, to help us survive. We each have jobs to do. Most of us are workers but some are soldiers, guarding the nest. They defend the colony by biting, stinging, or spraying acid at attackers." Does it help to know more about ants? While I can appreciate their tenacity and cooperation, I still want them out of my lawn!!! There's more...if you want the scoop on bugs right from the source, find this book and share it! "Wangari wrapped her arms around the trunk as if hugging her great-grandmother's spirit. She promised never to cut down the tree." It's inspiring to have another book about Wangari Maathai, the first African woman and environmentalist to win the Nobel Peace Prize (2004) for her work in Kenya. Growing up there, she learned a love of the mugumo from her mother. She watched as monkeys climbed its branches, as birds sang songs from their airy nests, as animals and people shared its fruit. As she sat in its shade on hot afternoons, she learned that her people believed their ancestors' spirits found solace there. Wangari's thirst for knowledge led to an education that few girls in her small village received. When she wanted to further that education she moved away from her family and studied in Nairobi, before going to the United States for university studies. There she was greatly encouraged by her professors and eventually she returned to a teaching position at the University of Nairobi. Much had changed in Kenya since she departed for studies in the United States. Trees were being cut down and the environment destroyed to make way for 'progress'. She knew it would have a detrimental effect on her people. She set out to replant the trees that were being destroyed. Encouraging women to join her, they formed the 'Green Belt Movement' which has led to the planting of thirty million trees! That work resulted in a renewed respect for the land that was being systematically destroyed. The Nobel Prize, when it was presented, was a worthy thanks for the environmental concern she held for her beloved country and people, and for the future of our world. There is much to ponder here for older readers. Maathai faced numerous obstacles as she sought her doctorate degree in biology and further, as she struggled against those greedy for the land that had sustained her ancestors and her village. 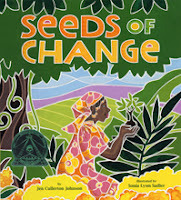 It holds a worthy place alongside three other books about this remarkable woman...Planting the Trees of Kenya (2008), Wangari’s Trees of Peace (2008), and Mama Miti (2010). Using scratchboard and oils, with bold color and white outlines, Sonia Lynn Sadler has created lush quilt-like spreads which have at their heart the sacred mugumo tree that has inspired Wangari's life work. It is a beautiful book! It must be Mole's first spring because he's not sure that it has yet arrived. He sets about finding out for himself. The air smells sweet, the sun is shining gloriously and there is squishy mud to dip his toes in when he steps outside. It must be spring! He wants his friend Bear to wake up and enjoy it. No matter what Mole does, Bear just keeps right on snoring. Mole even gets close and tries tickling his nose. It does not rouse his sleepy friend. Wait! He's got another idea. This one involves egg gathering, cow milking, butter churning, and some mixing. Breakfast in bed finally does the trick! As Bear awakens to enjoy the feast, he calls to Mole to wake up because spring has arrived. Mole is just too tired to care! Awwww! Little ones will love this story of friendship and light humor. It's a charmer. 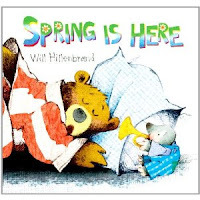 It's a perfect book to share with little ones, with its accompanying sounds and simple text. The mixed media artwork has a gentile spirit, in keeping with the story's tone. The colors are warm and cozy, the lines softly drawn. It sure to bring enjoyment to its intended audience. "Each habitat can support only a limited number of species and every species adapts itself to suit a particular role in that habitat. By eating different foods or making its home in a different place, a species can reduce the competition it faces from other animals, yet live side by side with them." Here we get a chance to see animals as they have lived through the ages...what has happened to some of them and how do we prevent it from happening to others? It begins with an overview of the variety among animal species, and then moves to showing each of the animal groups and some of the animals within those groups that are in danger. The writers include a ranking system that show nine risk categories...these include near threatened, vulnerable, endangered, critically endangered, extinct in the wild and extinct. Three are minor categories. In the introduction to each animal group, there is a description of the main characteristics, many wonderful photographs and a sampling of the animals under threat. There are symbols offering the reasons for the perceived threat under each text box. The main threats are: habitat loss, climate change, hunting, food supply, pollution, and disease. "The sea otter's coat is incredibly thick - it has around one million hairs in every square inch of fur." There is good news. Some species have been saved from extinction through a variety of measures...breeding programs, relocation, organizations , legal protection, and vaccination from disease. It takes a lot of effort on the part of concerned scientists and caring individuals. 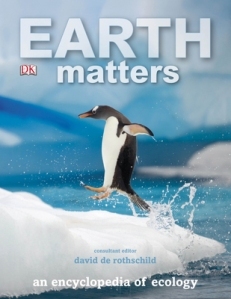 Young readers are encouraged to become naturalists, to set up reserves, and to learn as much as they can about the animals of the world so that they will want to protect them always. A glossary helps with unfamiliar language, and an index takes readers back to those pages they want to see again. We wondered if Noah would need to know the story of Rapunzel before this book was shared with him. Of course, he didn't! I mean, who wouldn't get a story that is filled with humorous happenings because of an inability to hear clearly what is being said from a distance. Rapunzel is, after all, high up in the tower and the Prince sits upon his horse far below her window. This is one of those books you might get tired of reading before the young 'uns are tired of hearing it again and again and again! I have always been eager to see 'fractured' fairy tales...some of them are absurd and very funny. Some are not. But, when you find one that you know kids will enjoy, it is sure to be a memorable experience. 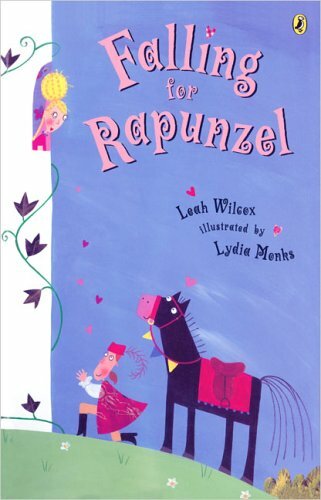 Leah Wilcox does not disappoint with her first foray into the field of children's literature. It is an auspicious debut, I think! they'll think to knock on my back door." The kooky collage illustrations will have listeners searching the pages for added humor. As the prince rides up, observant young listeners will notice a city in the background with a highway leading to it, a plane flying above it and Red Riding Hood making a trek across the top of the hill. On it goes! Great language, perfectly matched illustrations and a boatload of fun will make this a much requested read. "With grasslands spreading all over the world, it's hardly surprising that there is a great diversity of animals living in these ecosystems. There is as much activity below ground as above it. Grasslands are open spaces where there are few places to hide from predators..."
As is the case with all of DK's incredible nonfiction , the first thing you notice in this engrossing book is the use of bold, bright graphic artwork. There are diagrams, photographs, maps and timelines, all included to give readers a close-up and personal look at our world and why it 'matters'. The language is most appropriate for the target audience, ensuring their attention and ability to process the information shared. In fact, they make it quite undemanding, even when covering such complex issues as the greenhouse effect. It works for me, too! While the tone is of needs scientific, it is not overwhelming with the crisis that faces us; rather it encourages readers to learn about this place we live in order to cultivate respect and awareness for sustainable living. Each ecosystem on our planet is connected, making for a huge and wonderful place to live. All who are interested in the way the world works, and our place in helping to sustain and protect it, will find much to ponder here. 'We are all it together' is a recurring theme and gives young readers a sense of hope and purpose for the future. Sometimes alarming, it is a book best shared with children and adults. That being said, children will pore over the pictures, the informative captions and find much to inspire their further learning. By sharing it with an adult, they may get help with questions they have as they arise. "With rising sea levels and heavier rain, floods will be more common in many places. A warm current called El Nino, which brings heavy rain to South America every few years, seems to be happening more often and more strongly. Countries at extra risk of flooding need to bolster their defenses, and lay disaster-relief plans." It is a message for all of us! "It is cozy in there", she thought. Aren't there times when each one of us dreams of being 'outside' the confines of hearth and home? Nini is a beautiful tabby who notices through the open door that there are enticements beyond her home's four walls. She loves the blue of the sky, the smell of the grass and flowers and she wants to be there. So, off she goes. Feeling trapped by the noise and her fear, she worries that she will not find her way home. As if on cue, she hears soft, familiar, loving voices calling to her. Still frightened she decides that she must show some courage and head toward home and safety. She does just that! "I am sorry, sorry, sorry...""
And, for now, she is content. 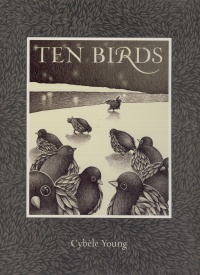 Short, accessible sentences for young readers, beautiful detail-filled artwork and a terrific readaloud. Can we ask for more? "Wellington gobbled. Wellington swobbled. Wellington ate and ate. Every last gorgeous, every last worgeous, every last squorgeous bite. Then he lick-lick-licked the pan for the memory, the m-m-marvelous memory. M-m-meatloaf." Welly, well, well! Here's a dog bent on destruction, I think! He is not in a happy place; the fire has gone out and his back is cold, the smell of fresh meatloaf hangs in the air, the cantankerous house cat has swiped his nose AGAIN and it's raining. He hates walking in the rain! As his master sleeps, Wellington becomes bored. Turning his attention to the meatloaf seems the solution to his state of ennui. Now, what to do with the empty pan? Ah, Honey's litterbox is close and convenient. It provides the perfect hiding spot for the evidence. As happens with me on occasion, once food is tasted, it always leads to MORE. The garbage offers sensational smells and untold treats. Once he has eaten his fill, Honey approaches. He upchucked. He barfed. He spewed." Even Honey is caught in the crossfire. With good common sense, Welly quickly cleans up the kitchen (you don't want to know how! ), just in time to accept Master Horace's invitation for a timely walk. The Master is pleased with their time together and promises warmth and a special treat when they get back home. A touch of apprehension surfaces. What will happen when the Master notices the meatloaf is missing? Not to worry...all is well! There is a certain poetic justice in the discovery made! And I haven't even mentioned the droll and most expressive artwork! They add to the 'flavor' of the book by giving us a clear picture of the characters, and their antics. 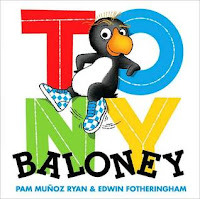 Poor Tony Baloney...he's a macaroni penguin caught in the middle of a family that sports three sisters for this lone male child. Big Sister is the 'boss' in the family and Tony seems to be at her beck and call when it comes to playtime. He complains that he is always the kitty. The Bothersome Babies Baloney are soother-sucking, diapered twins who manage to mess with most of what Tony holds dear. For hours it seems, Tony does what is asked of him. Finally Dandelion, his best stuffed friend, becomes tired of it all and turns to misbehaving. "I need to think about our behavior and using our words and saying we're sorry. Oh, and we have to mean it, too." Dandelion is 'not yet feeling nicely in my heart'. Thus, the talk and deliberation continue. It takes a while. When the smell of fish tacos wafts into the 'hideawaysis' (thank you, Katherine Hannigan), both seem more prepared to get on with the task at hand. Apology accepted and the Bothersome Baloney Babies proving adept at meowing, Tony need not worry about being the kitty...ever again! Big Sister Baloney has an even better idea! What fun Pam Munoz Ryan must have had in finding the perfect 'voice' for a young disgruntled middle child, with some mischief on his mind! Then, to have Edwin Fotheringham bring her characters so brilliantly (in color and otherwise) to life is surely the icing on the cake. His use of bold primary colors and so many telling details adds wondrous fun. The always present trails of Parmesan cheese, the constant motion, the expressive faces and the surprise ending make this a book that will requested repeatedly. I know I will be reading it time and time again! This is a racing track!" Can you guess by looking closely at the front cover what this book has as its focus? Have you met Rabbit and Pig in a previous book? I hope so...I met them first in the companion book to this one...Me and You (Kids Can, 2009). They were wonderful then, and they are equally wonderful now. In fact, they are best friends! In the tale they help their young audience understand what can happen, even in the best of friendships. It takes two to make that special bond work. It is a difficult lesson to learn. Their story begins in conflict. Rabbit thinks that Pig is pulling the wagon too fast, while Pig is delighting in the race. Rabbit complains about carelessness and Pig responds with a line about fussiness. It isn't long until hard feelings cause a rift and result in a parting of the ways. "I can play dress-up without you. I can go to the park without you." when I read it to you!" Isn't that the truth? Everything's better with friends. I know it, and you know it. Now, Rabbit and Pig know it, too! 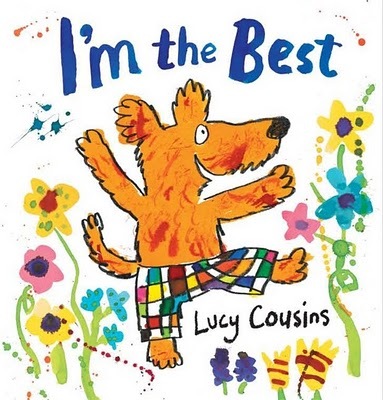 Charming, spirited and oh, so perfect for little ones and early readers. It won't take any time until they are reading it on their own! As you can see from the above quote, Dog has a pretty high opinion of himself. If you have had experience with this kind of friend, they can be awfully hard to take. He can run faster than Mole and doesn't mind announcing it to the world. He can dig holes better than Goose...and on it goes. The other animals are definitely outmatched at the contests that Dog presents, assuring himself proof that he is 'the best'. He is relentless in his efforts to prove himself. It takes a toll on his friends, as even the youngest readers will anticipate. Their sadness is palpable, but they are not ready to give up. What if Mole dug the holes? Who would be better? And what about Goose swimming with Dog? Who would win that contest? I'm not the best at anything. I'm just a silly show-off." Oops! Now his friends must convince Dog that he is good at many things, but especially at being a best friend. Oh, and with beautiful fluffy ears, too. That makes him happy and he is off on another round of bragging. When will he ever learn? "I'm the Best I really enjoyed because it was with inks rather than paints, so it felt new. The line is a pencil drawn line rather than a brush stroke. So I'm starting to feel that I like experimenting to find something different and a little bit fresh. With I'm the Best, I wanted it to be very, very bold, almost like my sketchbooks. Often when I'm doing my sketches for ideas they have a real vitality to them, and when I've redone that page seven times and had a go at a few colored paintings it's quite hard to keep that freshness." I love her artwork....the bold, vibrant colors, the expressive faces of Dog and all of his friends, the smudgy watercolor details and the fun there is to share with young listeners. This is a story with much to consider and is sure to encourage discussion about what being a friend really means. "Oh, no!" screamed the piglet. Fox cannot believe his great good luck when a Pig shows up at his door looking for Rabbit! He opens it and welcomes Pig into his home with a roasted pork dinner on his mind. He sets about making his dining dreams come true. Pig has the wherewithal to trick Fox into cleaning him up first. After all, Pig is filthy and won't make much of a dinner when the roasting pan is coated with dirt. Fox takes Pig at his word, and goes about finding wood for a fire and a big potful of water. Then, he scrubs Pig with tender loving care. Pig is most appreciative and full of praise for Fox's adept handling of the bath. Now, that he is clean, Pig is sure that Fox can see how small he really is, and he suggests that a good dinner might fatten him up. Fox puts more energy into creating a delicious dinner of spaghetti, with a cookie chaser. The time has come! Well, maybe not. Pig feels that his meat might be tough without a massage. Fox acquiesces and sets about giving Pig a full body massage, using all of his leftover energy squeezing, pounding and kneading Pig into a tender and soft specimen. Alas, Fox passes out from the exertion, leaving Pig to take his leave. It is only on the final page we discover that Pig knew just what he was doing! Now, he can set his sights on 'Wolf who lives next to the tallest pine tree' or 'Bear whose house has the red roof by the river'! Don't you just love trickster tales?? Angela's grandson Noah thought this book was worthy of repeated readings and he's only three...but he loved the fun and humor of it all. Such a silly Fox to be tricked by a much smaller Pig! "And every evening, Hopper sneaked past Dad to sleep on Harry's bed. He started at the bottom of the bed, then wriggled to the top, next to Harry.
" Good night, Hopper," said Harry. And they gazed at each other, their eyes gleaming with mischief and delight." Harry and Hopper are best pals, and have been since the moment they set eyes upon each other. Hopper was just a jumpy, wiggly puppy then. Harry was a little boy with great love to give. They spend as much time together as they possibly can. An accident ends all that. When Harry comes home from school to hear the news from his father that Hopper has died, he is frightened and thrown off balance. He cannot accept the fact that Hopper will no longer be in his life. His bed is no longer the haven that it was when Hopper shared it and Harry cannot bring himself to sleep there. His dreams are filled with images of Hopper, and Harry finds it hard to separate the reality of his death with the dreamtime visits he makes at night. The recurring dreams bring changes in Hopper and too soon those images fade away, allowing Harry a final farewell. When I was working in the library, and in doing workshops with teachers, I am often asked for books that will help children come to understand death and grieving in a more tangible way. A book might be just the catalyst needed to help them talk about some of the uncertainty and sadness they are experiencing. It is a struggle for them. Harry's reaction to the death of a beloved friend is common: withdrawal, refusal to acknowledge what has happened, imagining the world returning to what was normal, and finally, acceptance. Margaret Wild handles a tough subject with a deft and sympathetic hand, allowing Harry to grieve in his own way and time, always acknowledging his need to keep Hopper in his heart. This is a lovely book. "Children dove into the dirt first, carefully sifting and picking out every seed. Their smiles grew larger with each "royal" seed that they uncovered. Within a few minutes, all the seeds had been gathered, and then the dirt itself was scooped up and carefully placed in bags to bring home." Millions of people the world over consider rice their major food source. Thus, it is a valuable and necessary crop. 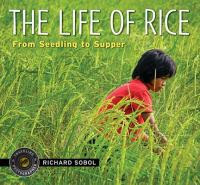 Richard Sobol invites young readers along on a photographic journey to Thailand so that they might see, virtually first hand, the 'life of rice' through his camera lens. He takes us to the rice paddies where ceremonies celebrate the planting of the rice seeds. It takes people, animals and machines to get the crop in the ground, to tend it, to harvest it. When all of that is done, the work is not yet complete. Before it can be sent to markets and distributors it must first be dried and then put in bags for purchase. It is a labor intensive process...even the stalks that remain following harvest are recycled to feed animals. Here are a few of the interesting facts that he includes: there are 40,000 varieties grown, it is the staple of more than half the world's people, and 600 million tons are grown each year. Amazing! Donald Sobol carefully balances photographs with text, making this book accessible to many. He adds Rice Facts, a glossary of needed terms, and even a list of rice holidays celebrated throughout the time it takes for rice to go from seed to table. And if that isn't enough to satisfy a child's curiosity about rice, he offers online sites and other sources for further learning. It's when I see the fun that Suzy Lee has in creating her remarkable picture books that I wish I had just one ounce of that creativity! In this wordless work (well, there are two words and you've already read them! ), she shows us how spirit and imagination bring joy to the lives of young children. It begins when the attic light is turned on, and our young miss notices that shadows are cast below her. As the pages turn, her sense of wonder soars and soon she is inhabiting a totally different world. The objects are common; a ladder, a broom, a bike, an old hose, a vacuum, and some boxes. 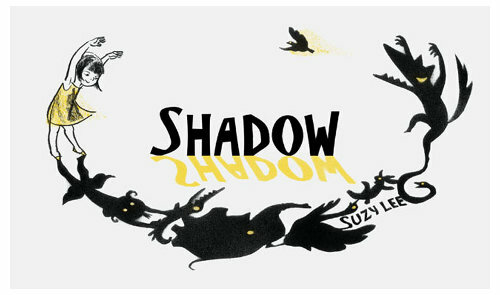 It is what Suzy Lee does with them on the shadow side that takes our breath away. For, at the top, we can see what is really happening but in the shadows, we get to see a little girl's brave and fanciful other world. It is so typical of the young child, and it is so charming to think that the world around her offers these delights. With her fingers she fantasizes a bird, with an old shoe a wolf. The shadows grow and the story does, too. The bird flies off, flowers appear, along with the sun and moon. As we look from top to bottom we clearly see the two distinct worlds open to us. It is not long until the shadow world begins to change and become more sinister, leaving her in the attic world with only the vacuum and some boxes for company. The wolf formulates a plan to make her his dinner and she must find protection on the shadowed side. The table turns. Finding himself alone now, the wolf is inconsolable. Not to worry, peace prevails...and then dinner is called! Her world returns to its original form and all is well once again. The light clicks off and we are left to savor this wonderful journey of the imagination. But, wait! There's more. Now, turn it upside down and read it from a distinctly different perspective...it's amazing! Thank you, Suzy Lee. and get lost in blue. It's been a long time since I visited a park and took to the air on a swing. I remember the feeling of freedom and wonder as I soared above the ground, and even occasionally tried flying my way off. As I said, it's been a looooonnnnggg time, but I don't think you ever forget that feeling, do you? It felt like you might kiss the clouds. We accept an invitation to follow this lively young lady when we open the cover of this quietly contemplative book. She helps us lose ourselves in the beauty and color of her world, rising through it before softly returning to earth, and then home. The text is rhythmic and manageable for the young readers for whom this story is written. The illustrations are filled with color and warmth, encouraging thoughts of balmy spring sunshine and anticipated delight. It is a magical interpretation of this young girl's world as she lets her imagination soar. Tricia Tusa used an etching process to create her light-infused, motion-filled artwork. It is a rendering of our perfect childhood memories...long, lazy spring and summer days filled with wonder, wander and whimsy! Can you see yourself in its pages? Isn't that what we do whenever we look at the world through the eyes of our children, grandchildren, young students? This is a lovely reminder to do it more often. “I really wanted this book to have a very imperfect, hand-done quality to it, similar to the books I loved as a child. And so I decided to use an etching process. I etched the linework into a plate, rubbing inks into the line. I then rolled the plate and paper through a press. I decided on a limited palette of color and applied it as a single layer, printing one color at a time — almost like a monoprint. 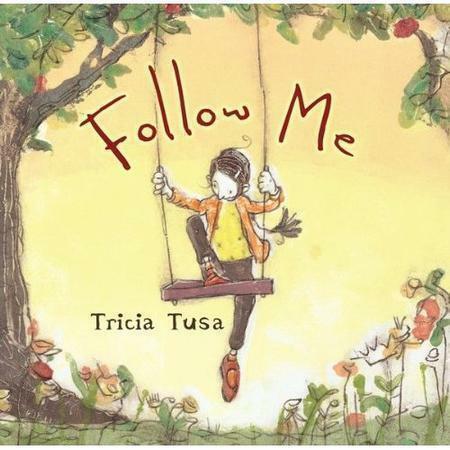 With this book, I wanted to try to convey, with as few of words as possible, the feeling of connection to self as a child — where all senses are fully engaged. An intensely satisfying relationship between you and yourself. One I discover daily … and still enjoy." Here's a counting book with a difference! It is not at all what we have come to consider typical of its ilk; they are often designed with bright and colorful pictures and an upfront math format. Rather, its pages are filled with pen-and-ink framed artwork that offers an invitation to observe carefully each new page and to encourage its readers to think critically about the drama as it unfolds. Those illustrations are drawn on ivory background with little to take the child's attention from the job at hand...counting down from 10 to 1. There are ten little birds here whose obvious and immediate task it is to cross the river that is right in front of them. As they proceed toward a host on interesting and somewhat familiar objects, we are left to guess how they will be used to achieve that end. The birds wander through the collection, poking and contemplating. It is the "Brilliant" one who takes the first step and leaves all others behind him. Thus begins this 'witty fable about ingenuity and common sense'. Once the brilliant one has devised stilts to march himself across, will the others be able to follow in his footsteps? This amazing author does everything right. Her language ups the appeal for the youngest reader and for older ones alike, using report card vernacular to describe each of the birds, which adds more humor to the telling. As well she relates each attempt with always changing phrases....'figured it out', 'devised a plan' 'found a solution'; all the while extending our vocabulary. She capitalizes the numbers in the text (SIX) and shows its visual counterpart beneath it, in the smaller illustration. Leave it to 'needs improvement' to find the simplest of all solutions! Kids might question why the birds didn't just fly across the river? They fly away from it! Where would be the fun in reading such distinct and imaginative fare be if that happened? Enjoy...it's worth reading again and then again. "Delly'd been sweating all morning, hauling stuff for the hideawaysis. At lunch, when Clarice got up to make more grilled cheese, Galveston hissed, "You smell like pig perfume." She waved her hand in front of her face, like she couldn't stand the stench. But instead of whomping her, Delly whapped her with a question. "Gal," she whispered, "how'd you like a dead squirrel under your pillow?" That silenced her." I love this book! 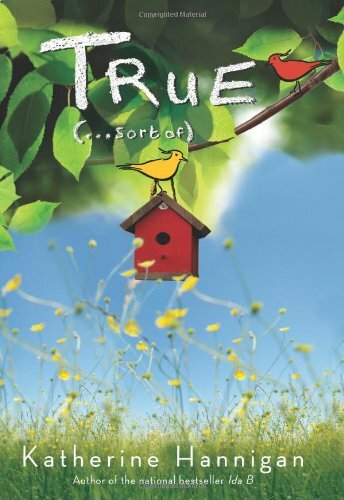 Katherine Hannigan creates unique and authentic characters whose hearts are 'at the heart' of this funny, quirky tale of three young people. Each has a powerful way of communicating...Delly with her quick reactions and too often, her fists, Brud with a stumbling stutter that has other children teasing him unmercifully and Ferris, who doesn't speak at all but shows her admiration and concern in more tangible ways. RB, Delly's little brother, is a most amazing child with uncommon wisdom for one so young and an ability to bring peace and comfort to the other three. Once the story is read and savored, they will each live long in your memory. These kids are so real, and honest. They exhibit all of emotions that children do, sometimes making readers reel with feelings of annoyance and frustration. Delly is often contrary and concerned with self; upon getting to know her better we can overlook some of her faults to love her anyway. She is the catalyst for most of the action in the book and I cannot imagine a more endearing friend. I love her unusual, whimsical speech and will keep some of the 'delly'isms in my journal for future contemplation. It is what makes her so unique and original. The glossary is an enjoyable addition and interested readers will find it helpful. Ferris doesn't talk to anyone, not to her friends, her classmates, her teachers. While she will play basketball with Brud, and go to her 'hideawaysis' with both Delly and RB, she never talks. She will write short messages but they are meant to instruct not converse. RB has a way of bringing peace and calm to Ferris' mind, but she doesn't speak to him nonetheless. They become fine friends, exploring the nearby woods and spending time together every day. It is when Delly discovers the reason for Ferris' silence that she knows she needs someone to help her help her friend. It is a truth too terrible to remain hidden. This is a tale of friendship, family, discovery and honesty. It is so inspiring to watch Delly learn to deal with her demons, to respect Ferris' need for silence and understanding and to love and honor an annoying younger brother who has important lessons to teach. These are not perfect kids, but they are inspiring and genuine and they deserve our attention. If you loved Ida B and wondered if this accomplished author could do it again, wonder no more! She has crafted another exceptional story. There is as much joy as there is heartbreak. Put this on your Mock Newbery list and then push it to the top!!! "A chance encounter with a pickpocket on a train, a greedy scoundrel in front of Buckingham Palace, a strange remark from a fortune-teller, a mistress in high dudgeon - these were life's minor annoyances, and Penelope knew better than to make too much of them." I was very excited to get the second book in the Incorrigible Children series. I so enjoyed the first one, and wondered what might have happened following the fiasco at Lady Ashton's soiree. The wolfish (and so endearing) children have created chaos since their discovery in the woods. The house remains a mess, and the decision is made that the family will move to London while repairs are completed. "The children, on the other hand, were now wonderfully energized. They argued about where to go next. "The British Mew-eezum!" Cassiopeia suggested, adorably mispronouncing the word." "Penelope and the children watched Lord Fredrick in fascination. Even in the span of these few minutes, his twitching, scratching, and grunting had become more pronounced. So much so that Lady Constance, who rarely paid close attention to other people, had no choice but to notice." The adventure continues with a visit to the theatre, a pirate chase, a fortune teller, a concealed door and a hidden gallery. Along with the discoveries come more questions. As we leave them for a second time, we know that their story must continue. I know I will be front of the line when the third instalment is released. There is so much more I want to know about Penelope and these lively and charming children. “When things are looking up, there’s no point in looking elsewhere." Original, charming, humorous and oh, so entertaining. Ahwoooooooo! Tallulah waited for her tutu. But instead she got a hug. "Good job," her teacher said. must be coming from Paris." What's a girl to do when she loves to dance, learns the five ballet positions, practices tirelessly and still doesn't get her tutu? 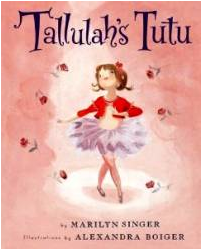 Tallulah knows she can be a great ballerina, and with a tutu she would only get better and better. The lessons go well, her teacher seems to really love her hard work. But a hug and a gentle kiss on the top of her head at the end of her lessons just don't cut it! She wants that tutu! When she runs out of excuses as to why the tutu isn't in her hands yet and already her 'third' lesson is complete, she makes the rash decision to give up dance. She can wait no longer! "Tallulah stamped her foot. It did not feel good to do that in a ballet slipper. "That's not fair!" she cried. "A ballerina needs a tutu, and she needs it now!"" 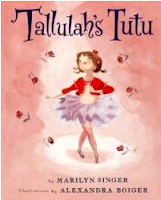 "But everything kept reminding Tallulah of ballet. Her neighbor's basset hound always stood in second position. The kitchen clock constantly performed ronds de jambe. The serving spoon at dinner was forever doing tendus." Just as most people who have put a stop to what they love to do, Tallulah decides that to learn to dance will be worth the work and the wait. She will keep practicing and hoping against hope that a tutu will be hers...someday! Now, to the artwork for this vibrant and charming tale. Alexandra Boiger captures Tallulah's endearing character on the cover and, once inside, on the front endpapers as well. Practicing her moves, she beams with pleasure and assurance. The use of the color red keeps our focus on her as she goes to her dance lessons and enjoys family life. There is such attention to detail and movement. Keep your eye on her little brother Beckett. His moves are pretty awesome, too. What a lovely gift for an aspiring ballerina in your life! getting her books for the week. Amanda's story is told in six and a half chapters, perfect for early reading and appealing to every single person that will share them. 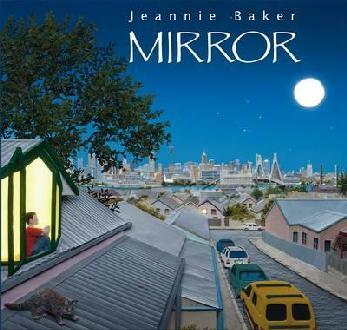 It looks like a picture book, but it is also a beginning chapter book which will appeal to readers a bit older. It is so much fun for everyone involved in bringing it to life! 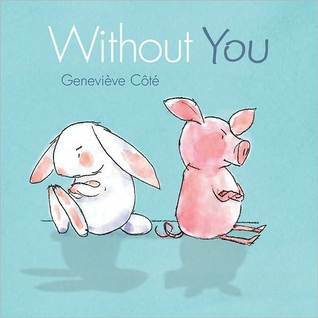 Those who love Mo Willems' previous books will find much to love here, too. A young girl leaves her stuffed alligator at home while she makes her weekly visit to the library. We know she must be having a great time. Unfortunately, Alligator is not. He sits in a corner, paces the room, plays with his tail and impatiently awaits the return of his best friend. He is unsettled when she is not near. He's ready for a surprise when she returns and she is adept at such matters. In the second chapter, Amanda is reading one of her new books when Alligator arrives with a surprise of his own. Amanda knows that Alligator has little imagination and guesses the surprise, leaving her friend to think seriously about what he might do to really give her a scare. The half chapter is short, sweet and perfectly executed. Finally, he wields a successful shock to her system. Unfortunately, that leads to a series of troubling questions and truthful answers and an alarming discovery that has Alligator concerned over his true worth. Amanda is diplomatic and pointedly honest in helping him gauge his value to her. The last two chapters are so much fun. Alligator shows his goofy side, and reiterates the fact that he is easily bored. When Amanda goes to the zoo with her grandfather, she comes home sporting a new stuffed toy...a panda! Some surprise! Luckily, Alligator is open to new experiences and that makes life good. There is comfort in familiarity and you will find that here. 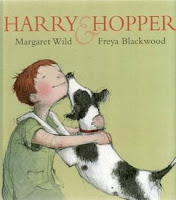 A little girl with a much-loved stuffed toy, an unusual friendship between two mismatched animals and some troublemaking. You must watch closely to make connections to some of Mo's earlier stories. The point of view belongs to the alligator. The importance of friendship is the overarching theme, and is recognized fully and embraced wholeheartedly by all concerned. 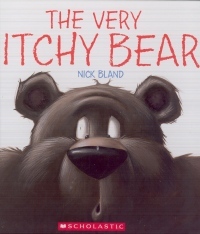 This is another great book from a much-loved author! "One family lives in a city in Australia, and one lives in Morocco, North Africa. The lives of the two boys and their families look very different from each other, and they are different. But some things connect them....just as some things are the same for all families no matter where they live." It comes as no surprise to me that Jeannie Baker has created another amazing and relevant story. 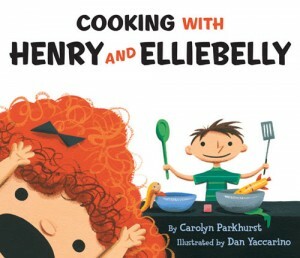 In her newest book, she proves that her imagination and artistic acuity know no bounds! She chooses to tell the stories of two families, inviting us into their homes and lives. One of the families lives in Sidney where the author makes her home. The Australian boy graces the front cover, looking at the moon shine over his beautiful urban environment. We watch as, during the night, he climbs into bed with his parents. Morning introduces us to the baby in the family, dressed in a yellow sleeper and eager to begin a new day. Moving into their story, we see the family going about its morning routines: feeding the baby and the cat, putting on the tea kettle, showering, making a list of items needed to complete a fireplace project. Father and son are off to town to get needed supplies. As they leave the hardware store the son suggests a stop at a carpet store. With the fireplace completed, supper is ordered and a surprise gift is presented. The final illustration shows the family sitting on the beauteous 'magic' carpet admiring their young son's artwork depicting a family-laden carpet flying over the Moroccan landscape. That part of the story happens on the left side of the book, with the reader opening pages from right to left. On the mirror side of the book, we open the pages from left to right, and the writing is in Arabic. Before sunrise we see the mother in prayer, and then working diligently on a colorful carpet. Turning the page, the family gathers for the first meal of the day and then sends the father and young son to market, with the completed carpet in hand. They travel by donkey through lightening skies, over narrow roads and past farmlands on their way to a larger center. They have selling and buying on their agenda. When their work is done, they take the long and tiresome trek home. There, the reception is warm and welcome. Supper is prepared, the family comes together in front of the computer, a coveted purchase. The final illustration shows the family, on the bare floor, logging in to see what the rest of the world has to offer. Closing the book offers a glimpse of a young Moroccan boy looking at the same moon as his Australian counterpart. The English introduction to the story is mirrored by Moroccan text on the right side. The stories are meant to be read together, going back from page to page and allowing readers to make the discovery that while people of the world may have differences, they also have much in common. 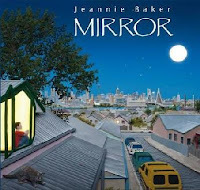 I could have written this entire post about the glorious, spectacular, brilliant and splendiferous artwork that Jeannie Baker has created for this nearly wordless book. Each turn of the page offers an invitation to explore the worlds she presents. I have pored over these wondrous pages a number of times, each time making new discoveries and upping my admiration for this incredible artist. "The pictures started as drawings. Using these drawings as a guide, collages were made. The collages were constructed layer by layer on a wooden baseboard using a combination of natural and artificial materials such as sand, earth, clay, paints, vegetation, paper, fabric, wool, tin, and plastic. The natural materials were preserved and fresh coloring added. The completed collages were then photographed to be reproduced as you see here." Hilarity ensues when a tiny flea simply wanting to say 'hello' does so by biting Bear. All does not go well following those tiny bites! Itching like crazy, Bear stumbles over a tree stump and tumbles down a grassy knoll and lands in the sea...book and all. Finding safety on a floating log, Bear has time to wonder what has happened to Flea. Finding Flea still aboard his bearskin, Bear flicks him far out to sea leaving each of them alone in a new and frightening world. When Bear sights a bird overhead and notes that its intention is to make a meal of Flea, he has a change of heart. Swiftly swimming to Flea's rescue, he protects him from the bird's beak. Flea is ever so thankful and puts a stop to chewing on his new friend. That makes for a fine and lasting relationship. The artwork perfectly matches the action-filled antics of a burly bear and his nemesis...a bear-biting bug intent on saying hello. The rhythmic language will soon have young listeners chanting along. There is fun here, but there is also compassion and friendship, letting readers know that compromise can be reached despite initial difficulties. I guarantee requests for another reading...and then a third, and a fourth and so on, and so on. It's great fun, and you won't be sorry to share it again! to me at all, that is." And she sat down on the porch. Is there any more common question to writers than where they get their ideas? It must be tiring to try to keep coming up with enlightened answers to that oft repeated question. And I'll bet those answers are as varied as those who ask the question. Wouldn't it be fun to collect answers from a large sampling of writers to see what they have to say? Perhaps they come in a dream, or following a long walk in the woods, or while having a cup of tea by the garden window. Perhaps they just won't find their way to the surface, creating a complication known as writer's block. In his new book Valeri Gorbachev describes exactly that with his pert and thoughtful Molly. She's a mouse poet in search of an idea. Molly has a passion for words and for putting them down on paper in poetic form. But, she is stymied. She just can't come up with an idea for the next poem. In the midst of her quandary, her friends arrive with a problem of their own. Turtle is celebrating a birthday tomorrow and they can't think of a gift. In talking it over, they each decide that they will draw a picture of a flower for Turtle. Molly works to dissuade them from that idea...who wants five pictures of a flower, brilliantly drawn or not? She suggests taking time to think. Off they all go to find their best thinking spot. When they return they discover that they have again thought of the same gift. Molly still has no idea! While discussing their new idea and its drawbacks, Molly is delighted to find inspiration. Using the tree as a starting point, each contributes a drawing for the poem that Molly is finally able to write. Turtle is thrilled with his 'all seasons' gift. 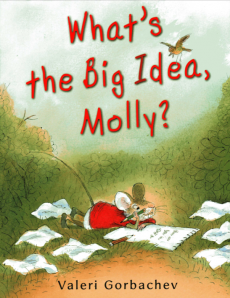 ""I wonder," she said, picking up her notebook and pencil, "if I will get another big idea tomorrow."" Her love of words and sense of humor intact, this creative author has taken equations to new heights and understanding in this little charmer of a book about playing with language. She begins with a few easy ones to get our heads around the game and then lets loose with idea after idea to show us the power of language and imagination. What an invitation she provides to young writers! While math equations were never my strong point, I can see that I would have had great fun trying these language equations. As with everything, we get better with practice and I think that the longer you let kids try their hand at them (either alone or with a partner), the more diverse and interesting they will become. Even the endpapers share the joy of friendship between sun and cloud. We meet the two narrators right away and learn that they are a pair: "1 + 1 = US" Even when disagreeing, they can come up with a suitable equation: "yes + no = maybe". As they become more complicated, they require some higher level thinking skills. Think "cozy + smell of pancakes - alarm clock = weekend". Now, there's some math I CAN do! Put your thinking cap on and get to work. There's fun to be had! "That sounded like a chore. Lucy didn't want to do chores. But she set out to the market." All Lucy wants to do is play with her red wagon. Mom agrees, but there is a catch. She would like Lucy to take that wagon and go to the market for her. A list is produced. Lucy is disgruntled with what sees as a 'chore' for her mother. Lucy doesn't like chores. 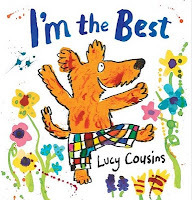 If you know anything about kids and their imagination you won't be surprised to see what happens as Lucy takes to the task given by her mother. It certainly isn't a dull journey! The text is plain and pretty simple. The gentle, loving artwork tells a completely different story. "She pulled the red wagon up the hill. Of course, it was. 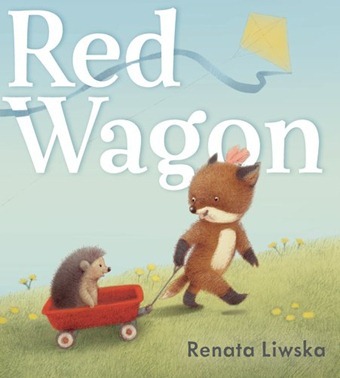 When we turn the page, we notice that the wagon is filled with a red squirrel and a headgehog. A bunny gives a helpful assist and a raccoon trails faithfully behind them. On and on they go, on a long and delicious trek that has a surprise rain shower spawn an uncontrolled ocean. The wagon then becomes the boat that crests the ocean waves and brings its passengers to safety, just in time to turn into a covered wagon, a caravan, a train car, and even a rocket ship! Tuckered out by the time she returns home, Lucy finds the perfect use for her new red wagon. If you are not yet a fan of Renata Liwska, you need to get quickly to her blog and see the wonderful work that she is doing. Her illustrations are done with pencil, then digitally colored. They glow with warmth and light. The child's point of view is charming and entertaining for young readers. What joy to celebrate the brilliance of a young child's imagination in such a clever and appealing way! "They pass by a bakery. As our population grows with the arrival of immigrants from many countries of the world, we look for ways to make them feel welcome and 'at home' in our communities. One of the simplest ways to do that is to learn a smattering of their languages...and what better word to start with than hello! A warm hello and a happy smile can change the day for anyone. Imagine the delight a Spanish speaking child or parent would feel to be greeted with 'hola' upon entering a classroom, a school, a clinic, the hospital! We don't need to be conversant, just aware. Carmelita and her mother are aware of the multicultural nature of their neighborhood and are proud to greet each of their friends and neighbors with a happy hello in their own language. On their way to visit Abuela Rose, they travel past Senor Enrico's bodega and offer up the warmth of a friendly 'Buenos Dias!' Smiles all around. 'Shalom!' to the Rosens, 'Konichiwa!' at the Japanese restaurant. All along the way mother and daughter offer cheerful greetings, while Manny barks 'WOOF!' It's a delightful trip. Don't be deterred from closely observing every facet of the bold, colorful artwork. 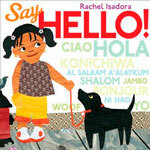 Rachel Isadora uses oil paints, printed paper and palette paper to cut, paste, entice and entertain her young audience. There is so much to see as we travel through the neighborhood with this amiable pair. From the 'speaks all languages' Manny to the 'jingle' of the ice cream truck, it's a visual feast for the eyes. And you might learn a few new words along the way! Concrete proof that we pass our genes to our children...Nell Jocelyn has the artistic talent of both parents. In this first collaboration between mother and daughter, we reap the benefits. Both are talented and share those talents in a perfectly simple concept book for the young. Choosing words that are 'spot on' for their audience and matching the text with dynamic, boldy colored collage artwork, they have created a rhythmic romp to be enjoyed time and time again. Look closely at the detailed illustrations and you will notice a variety of papers, textures, a mother robin with two eggs in her nest and a young girl, in runners and with a backpack, approaching a home. Take time to run your eyes along the bottom of the page where tiny details are added...leaves, shoes, socks. Do they tell us something about the characters? Is there something we can learn from them? Seems so simple, but adds meaning and understanding for young language learners and makes this another wonderful book for children just learning to read simple text independently. The art sings and will also provide encouragement to go out and find papers, objects, newspaper and string to try a hand at creatging similar artwork. Each time I look at this book I make new discoveries in the details! Read it with your favorite toddler, and then read it again! Let's keep our fingers crossed that this is the beginning of a long and productive collaboration between mother and daughter. In the end, we will all be better for it! "Whoever said that the past isn't dead had it backward. It's the future that's already dead, already played out. This whole night has been a mistake. It's not going to let me rewind. Or unmake the mistakes I've made. Or the promises I've made. Or have her back. Or have me back." 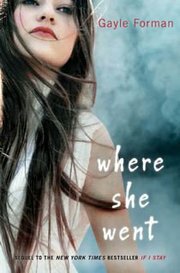 If you fell in love with Mia two years ago when If I Stay (Dutton, 2009) was published, you will have been longing to know the next part of her story. That heartbreaking book got the attention of many young adult readers and held them rapt as they waited and wondered if Mia would live or die. It introduced us to her family, her extended family and to Adam, who loved her fiercely and begged her not to let go, to stay and move forward with her music dream. This sequel, narrated by Adam, explores his devastation following Mia's departure for Julliard. Much has happened in the three intervening years. Mia walked away to pursue her cello studies, and Adam went on to achieve rock star status with his band, Shooting Star. He is now relentlessly pursued by fans, reporters, and groupies. He travels apart from his bandmates and has little in common with them anymore. So, while he stays in New York because of superstition and angst, the band travels to Europe without him. Adam will join them a day late to do promotion and get ready for their new tour. "I want to touch her to make sure it's really her, not one of those dreams I had so often after she left when I'd see her as clear as day, be ready to kiss her or take her to me only to wake up with Mia just beyond my reach." A chance encounter, a tour of Mia's favorite haunts in New York, and an attempt to come to terms with everything that has happened since their parting makes for some very compelling storytelling. Adam's story is told in alternating chapters between the past and the present, what has happened and what is happening now. His lyrics from the band's double platinum album begin the chapters dedicated to present time and they give a poignant look as what life without Mia has been for him. She tells him about her three years, and the moves she has made toward healing, Both are feeling anger and pain, neither is willing to just walk away. Fate has intercepted in the trajectories of their lives, and is giving them a chance to clear up some of the hurt of the past. Will they be able to find common ground? Is the strength of their love enough? "And that's also when I made her the promise. The promise she's held me to. I did the right thing. I know it now. I must've always known, but it's been so hard to see through all my anger. And it's okay if she's angry. It's even okay if she hates me. It was selfish what I asked her to do, even if it wound up being the most unselfish thing I've ever done. The most unselfish thing I'll have to keep doing. But I'd do it again. I know that now. I'd make that promise a thousand times over and lose her a thousand times over to have heard her play last night or to see her in the morning sunlight. Or even without that. Just to know that she's somewhere out there. Alive." so reporters can't find her. Three famous women, born in the same year, going forward to make a life that inspires their daughters, and anyone else who reads of their passion and independence at a time when most women did not make a name for themselves. In poetic form, Jeannine Atkins tells her audience about Laura Ingalls Wilder, Madam C.J. Walker and Marie Curie. She does so with skill, admiration and following much research. In each case, both mother and daughter have a voice. The author moves from one point of view to the other with dexterity and seamlessness. While they are similar in nature...all being self-reliant, driven, and more interested in their own work than with their daughters, their careers and their motivations are very different. Laura Ingalls Wilder is a farm woman and a writer. Madam C.J. Walker is the daughter of former slaves and an empire builder. Marie Curie is an acclaimed scientist and a Nobel Prize winner. Mrs. Wilder loves her home and cannot leave it to make the trip to visit her pregnant daughter. Madam C.J. Walker has known dreadful times, and lives in fear that her business will not support her for as long as she might need it to do so. Marie Curie works endlessly to make important scientific discoveries, often not noticing the two daughters who so desperately need her love and attention. 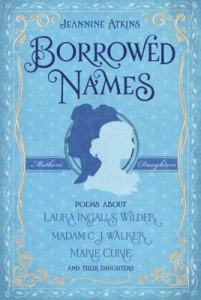 The author introduces each of these amazing women and their daughters in a series of factual and brilliant poems. Their feelings are laid bare in short scenes that impart much about their life and times. There are powerful emotions, vivid scene building and memorable characters. We come away from the reading informed and filled with insights about their relationships to each other and to the times in which they lived. Of this work, Jeannine Atkins says: "
Poetry gave me a way to work with facts and still let myself be surprised. I tried to show common places where readers could find sturdy bridges to lives different from their own. I hope readers will meet people who seem both wonderfully new and vividly familiar. And I hope those of you who are writing poetry won’t ever lose faith in the power of small words and the pauses between them." I learned much about the women who come to life through Jeannine Atkins' wondrous poetry. The reading left me wanting to know more...and isn't that 'a good thing'? Today's the perfect time to tell you about these mothers and daughters...here's a wish for a blessed and happy Mother's Day to every mother reading this post! but it didn't feel that way. I told on my friend. I stole my father's keys. I lied about it all. Power in poetry? You bet there is! This harrowing story is told perfectly as a novel in verse. It is filled with anger, hate, sadness, confusion and tension. I could not stop reading once I started, and I feel drained and in limbo now it is done. We know about school shootings. We see the aftermath in news reports, and sometimes news teams are reporting as it happens. We see the people, the place, the action; but, can any of us conceive of the events leading to it? So many kids today are dealing with difficulty and despair. It might be about family issues, lack of support, money, drugs and alcohol, bullying and abuse, any number of social issues that leave them feeling hopeless and helpless. And, let's remember (despite our years of decision making and learning from our mistakes) they have not experienced much of life and have little basis for understanding the consequences for their response to perceived, or real, wrongs. Ryan Van Cleave, in his first novel for teens, seems to get it! Andy is a freshman and the janitor's son....it's not enough to be new and uncertain, right? He is teased by peers, does well enough in school; but, he has no friends. There are others like him but they don't gravitate toward each other. How hard is that? When he meets Blake, he seems to have found a kindred spirit. They are both good kids, have issues, and don't make trouble. The author keeps the action taut and moving quickly. Always a bit of a mystery, but reeking of impending doom. What would you do if you thought your friend might be planning something dire? Impeccable writing, perfect foreshadowing, intense sympathy for the two boys and reasonable anger at those who cannot see the consequences of their own actions make this a read I will not soon forget. And, I will eagerly await Ryan Van Cleave's second novel for teens. Thank you! Can it be five books already? That Scaredy Squirrel just never gets old! I am in awe of authors who can maintain characters and make them seem new, even though they have written numerous stories about them. Melanie Watt does it in spades...with Scaredy and with Chester. It is such a joy to sit with a young reader and share this book. After all, next to Christmas, birthdays are about the most important day in the year of a young child. It is the same for Scaredy, although he must deal with his many foibles before being truly able to enjoy it. The poor guy! "WARNING! 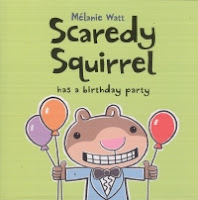 Scaredy Squirrel insists that everyone put on earmuffs before reading this book." 1:19 Play a quiet game of dominos." Once planning is complete, Scaredy awaits Buddy's arrival. Oh boy, he brings along some 'party animals' to help Scaredy celebrate! Despite Scaredy's many efforts to gain control, the party goes on around him and everyone has a wonderful time. When the time comes to cut the cake and open his surprise gift, Scaredy has a change of heart for next year's party. He's already making the plan! Isn't that what we would expect of him? "Podracing on Tatooine is so dangerous that even the best racers are lucky to survive. It's too fast for humans, but Anakin Skywalker is no ordinary human - he has Jedi reflexes. His ability with the Force means he can navigate every swerve and tight corner of the Boonta Eve Classic Podrace, all at super-high speeds. No only does he survive, he wins!" I thought I knew a lot about Star Wars. That changed completely when I pored over this image-filled, fact-filled book about the Jedi. We watched the first (well, last) three Star War movies when our kids were young and fell in love with the characters, the drama, the humor...heck, we even bought them in VHS format and they cost about $100 each. Bret loved everything about that first movie and we went on to watch all three over and over again. We bought the character figurines, the X and Y wing fighters, the Death Star, the Ewok Village and they made for hours of fun and delight day after day. "Obi-Wan is fiercely loyal to the Jedi Order, democracy and justice. Even when held prisoner by Count Dooku, he refuses to join him. Nothing would make Obi-Wan turn his back on what he believes in." "Yoda is Grand Master of the Jedi Council. He shoulders the great responsibility of leading the Jedi Order. Famous for his unmatched wisdom, Yoda has a strong connection with the Force and often turns to it for answers." Now, I will have to learn much more about the others. Interested readers will find much here to guide them in the ways of the Jedi, as well as sections on building a lightsaber, tools of the trade, Jedi comrades, and choosing from the two sides of the Force. It's quite an amazing lesson in all things Jedi. All members of the Jedi High Council are described, with later council members added as well. Small black circles include bits of Jedi wisdom and are placed randomly throughout the text, as are Jedi Stats which describe characters according to their species, home, rank, combat style and trademark. The Sith remain as frightening as ever they were onscreen and I would avoid them at all costs! Additional to the jam-packed text are the glossary which is useful and easy to read because of its design, which is alphabetical. The index leads readers straight back to what might be most intriguing at any time. This was a bit of a time travel for me, but also an invitation to see what I have missed in the last (well, first) three movies.